Finding that unique gift for that particular person on your list is always a challenge — especially as the clock counts down to the holidays. 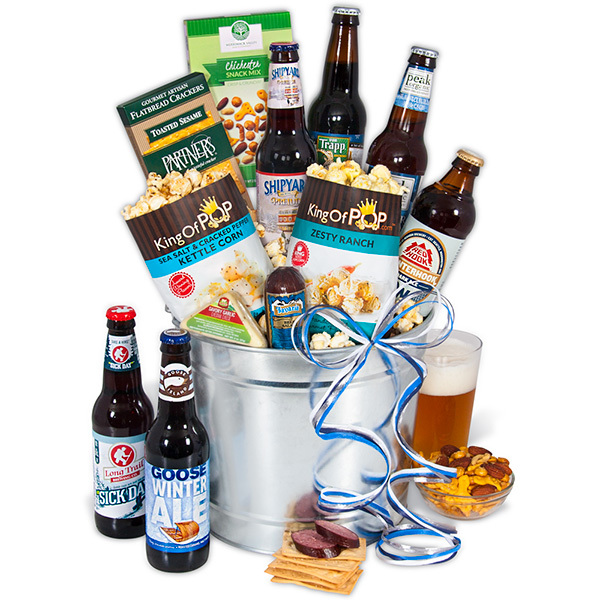 But given the huge selection of offerings that GourmetGiftBaskets.com and KingOfPOP.com provide for every member of the family, the office, or even the neighborhood, it makes sense to take a good look at their latest and greatest items. Hundreds of choices abound, including: 25 different cheesecake flavors, almost 100 different popcorn flavors, beer buckets, cake pops, wine suitcases, towers, upscale baskets, and more. And there are many new and updated items for Christmas, Hanukkah, and beyond, as well. Here’s a quick list of some of the most popular items this year, followed by some new (or most recently updated) items for Holiday 2016. Winterhook Dark Ale by Redhook – 12 oz. – Brewed differently each year, this Winterhook’s bold flavors and dark colors come from the addition of flaked oats and Munich malts that pair perfectly with three kinds of hops. Sick Day by Long Trail – 12 oz. – This hoppy brown ale is built for the cold, with pine and hop flavors balancing perfectly toasty malts for a smooth and easy to drink brew. Peak Organic Winter Session – 12 oz. – A winter wheat beer that uses dark malts to give it subtle toasty notes while still remaining quite hoppy due to the single-hop, dry hop process using Citra hops to give it the aroma of pineapple. Prelude Special Ale by Shipyard – 12 oz. – A rich, full-bodied English ale that’s the perfect winter warmer – it boasts a hoppy finish and a rich malty taste with nuances of holiday spices. Trösten by Von Trapp – 12 oz. – German for “comfort,” Trösten is a smoked black lager with rich flavor that finishes smooth and clean. Goose Winter Ale by Goose Island – 12 oz. – Layered with roasted caramel flavors and rich chocolate undertones, this beer is perfect for long winter nights. Sea Salt & Cracked Pepper Kettle Corn by KingOfPOP.com – 1.4 oz. – A delicious merging of salty and sweet, this popcorn pairs well with all of these beers! Toasted Sesame Flatbread Crackers by Partners – .75 oz. – Sesame seeds are integrated throughout these crisp crackers, giving them a consistent and distinctive toasted sesame flavor. Savory Garlic Cheddar Cheese by Mountain View Cheese Co. – 2 oz. – Premium cheddar cheese made zesty with the addition of fresh garlic. Salami by Bavaria – 3 oz. – Smoked salami made in the European tradition, and made with only the finest ingredients. Chichester Snack Mix by Merrimack Valley Snack Company – 2 oz. – A crunchy snack mix composed of premium nuts, crisp pretzels, and savory cheddar crackers. Zesty Ranch Popcorn by KingOfPOP.com – 1.1 oz. – Cool buttermilk and zesty spices combine to form a unique popcorn flavor that might become this gift recipient’s new favorite snack! Also new for 2016– Monthly POPCORN CLUB from $89.99 to $529.99, based on 1-gallon to 3.5-gallon tins. You can select three-month, six-month and year-long plans and choose 1, 2, or 3.5 gallon tins. There’s something for every taste palate and every budget — and what a surprise this popcorn membership would be for the person who just loves gourmet popcorn. (Translation: just about anyone).